Two years into his tenure, Indian Prime Minister Narendra Modi continues to ride a wave of public good feeling about the way things are going in India, the state of the domestic economy and his own stewardship of the country. About two-thirds of the Indian public is satisfied with the direction of the country and eight-in-ten think the economy is doing well. A similarly large proportion has a favorable view of Modi, a sentiment that is down slightly from 2015. Indians are positive about Modi’s handling of various challenges facing the nation, though there is a growing partisan divide over the prime minister’s record on various domestic issues. In addition to expressing positive views of their country, Indians believe it plays a growing role on the world stage. Roughly half are supportive of India’s burgeoning international economic engagement and are committed to their allies. At the same time, the public is wary of China and longtime rival Pakistan. They favor a militaristic stance against terrorism and support increased defense spending. But only about a quarter want their country to help other nations deal with their problems. These are among the main findings of a new Pew Research Center survey conducted among 2,464 respondents in India from April 7 to May 24, 2016. The Indian public’s satisfaction with the direction of the country has increased 36 percentage points since 2013, the year before Modi and his Bharatiya Janata Party (BJP) took power. Views on the economy have improved by 23 points. And belief that today’s children will be better off financially than their parents is up 8 points. A strong majority (81%) of Indians hold a favorable view of Modi, including 57% who have a very favorable opinion of him. A similar proportion of the public (80%) expresses a positive view of the BJP. Modi and the BJP enjoy overwhelming support among men and women, from people of all ages, educational backgrounds and income levels, and among people in rural and urban areas. Even a majority of backers of the rival Indian National Congress party (INC) express a positive view of Modi and the BJP. About half or more of the public approves of Modi’s handling of a range of domestic problems facing the country: helping the poor and dealing with unemployment (both 62%), handling terrorism (61%) and dealing with corruption (59%). And roughly half or more of Indians in the survey approve of Modi’s leadership style: 56% believe he cares about people like them, 51% say he stands up for what he believes and 49% say he brings people together and gets things done. Views of Modi’s performance are increasingly partisan as the divide grows between how BJP supporters and Indian National Congress adherents judge his achievements. When it comes to views of his leadership, roughly six-in-ten Indians who identify with the BJP see Modi as a unifying figure who stands up for what he believes and gets things done. Only about four-in-ten Congress adherents agree. Majorities of those who identify with the BJP approve of Modi’s handling of various domestic issues. Less than half of Congress supporters share that view. BJP support of the prime minister’s actions has improved slightly in the past year. But Congress approval has fallen sharply. This has opened up double-digit partisan gaps on Modi’s handling of various problems: 35 percentage points on his handling of corruption, 28 points on unemployment, 27 points on his help for the poor. Two-thirds of the public sees the Indian National Congress party in a favorable light and accords two of the leaders of that party – Sonia Gandhi and Rahul Gandhi – similarly strong favorable ratings. Notably, roughly half of BJP supporters voice a favorable view of the Gandhis (both 52%) and a majority has a favorable view of Congress (56%). Roughly half of the public sees the Aam Aadmi Party (47%) and Arvind Kejriwal, the party’s national convenor (50%), favorably. By more than four-to-one (68% to 15%) Indians believe their country plays a more important rather than a less significant role in the world today than it did a decade ago. And by roughly two-to-one (52% to 25%) Indians voice the view that their involvement in the global economy is a good thing because it provides India with new markets and opportunities for growth. Indians also favor toughness in dealing with the world. A majority (62%) believes that using overwhelming military force is the best way to defeat terrorism around the world. Few (21%) worry that relying too much on such force creates hatred that leads to more terrorism. And 63% back increased defense spending. Nevertheless, Indians give priority to issues at home. By more than two-to-one (53% to 23%) they believe that India should deal with its own problems and let other nations deal with theirs. This public preference for a focus on domestic issues reflects ongoing concerns about a range of issues: Roughly eight-in-ten Indians believe crime, corrupt officials, a lack of employment opportunities and terrorism are very big national problems. Indians have little love for China. Only about a third (31%) of the public expresses a favorable opinion of their emerging Asian rival. These positive views are down 10 percentage points in the past year, but unchanged from 2014. Another 36% voice an unfavorable opinion and 32% have no opinion. Large majorities say Beijing poses serious challenges for India. Seven-in-ten of those surveyed believe that China’s economic impact on India is a serious problem, including 45% who voice the view that it is very serious. 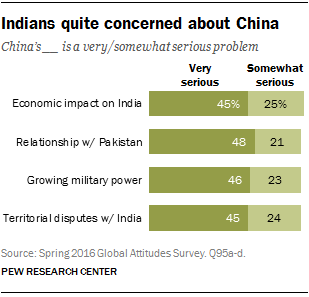 Nearly half (48%) of Indians think China’s relationship with Pakistan poses a very serious problem for India. Another 21% see this as a somewhat serious challenge. Fully 69% hold the view that China’s growing military power is a problem for India, including 46% who say this is a very serious issue. And the same proportion (69%) expresses the opinion that China’s territorial disputes with India are very or somewhat serious. Notably, with regard to problems posed by China, BJP adherents are more intensely worried than Congress backers. Indians are far more likely than Americans and Europeans to see their nation’s star on the rise. Roughly two-thirds of the Indian public believes that India plays a more important role in the world today than it did 10 years ago. Only about a fifth of Americans and Europeans (a median of findings from a survey of 10 EU members in spring 2016) hold this view of their respective countries. Only the Germans (62%), among the trans-Atlantic nations surveyed, have a comparable sense of their country’s recent ascendancy. At the same time, Indians (23%) are less willing than Americans (37%) or Europeans (40%) to help other nations deal with their problems. Roughly six-in-ten Indians say the use of overwhelming military force is the best way to defeat terrorism around the world. Less than half of Americans and Europeans agree. And about six-in-ten Indians back increased military spending. Only about a third of Americans and Europeans are willing to boost current defense budgets. Indians (49%) and Americans (51%) are more in accord about the value of working with allies, even if it means making compromises. Europeans (44%) are slightly less committed to such cooperation. And Indians generally share with Europeans a faith that global economic integration is good for their country. Americans (44%) are less certain. 1. How is India doing? 2. How is Modi doing?